We are wasting a lot of food. In fact, roughly one third of the food produced in the world for human consumption every year — approximately 1.3 billion tonnes — is lost or wasted. And we’re not just talking the browning bananas you forgot about in the fridge, it’s the myriad of products that are not considered good enough to be sold in the supermarket that are simply thrown away. The recent ‘Root to Stem’ movement might just start to change our perspective on food waste. Gaining momentum last year in the U.S. with chefs like Dan Barber and Jehangir Mehta, the idea is to use the entire product, for example carrot tops, cauliflower leaves, onion skins, potato peelings — every ‘scrap’ in other words. The movement has led companies to start recycling food scraps that would normally get tossed and use them in edible products instead. While they were undergrad students at UCLA, Dan and Jordan, the Founders of ReGrained Supergrain, were brewing their own beer when an idea struck them: they could create food out of the grain that was left from the process. The duo started baking and selling bread with the modest goal of making enough money to brew beer for free, soon realising that the possibilities of their idea were much bigger than a few loaves of bread: harvesting and upcycling this grain could create a massive potential food source. Further research quickly confirmed that leftover beer grain has incredible nutritional value, such as protein, fibre and a whole bunch of micronutrients. From there, the first ReGrained bar was baked in 2013. 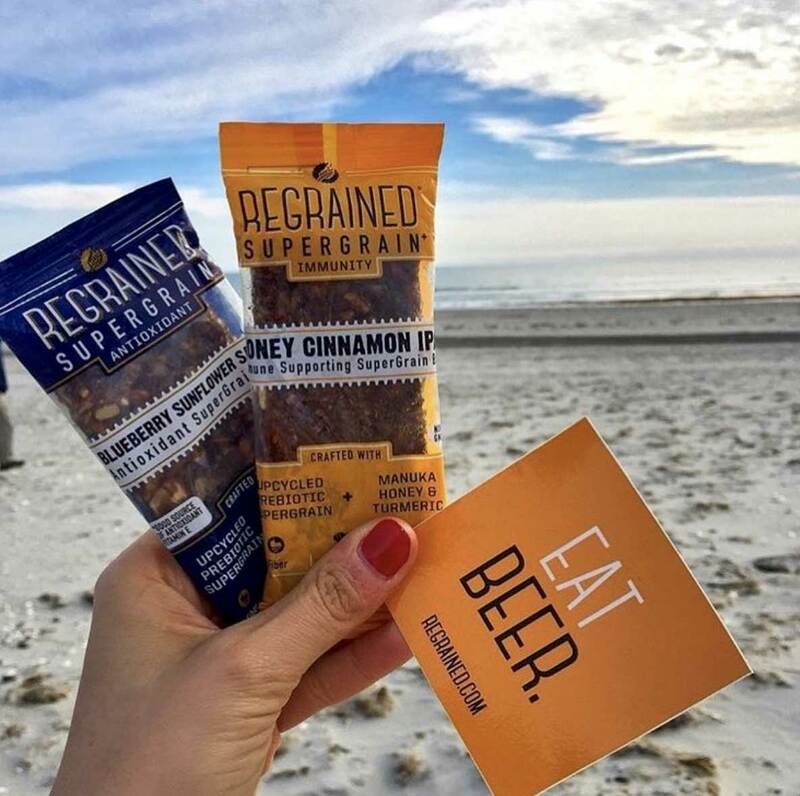 Today, ReGrained uses the nutritious grain from every beer brewed, and upcycles it into SuperGrain flour (a great source of prebiotic fibre to support gut health) using the company’s patent-pending technology. Who knew beer could be so good for us? After vegetables are juiced, it’s crunch time. Using what others don’t, Forager harvest the vegetable whole and use every delicious nutritious crunchy bit to produce 100% organic, non-GMO, gluten-free, corn-free, kosher vegan chips. Forager was created by a father and stepson who share a passion for organic, plant-based food. Each brought the best of their generational perspective; Stephen, an experienced food pro, disillusioned when reading ingredient panels that didn’t jibe with the front label, and JC, a young entrepreneur who couldn’t find the honest food he craved at stores. The two started their Forager journey with pressed vegetable juice and then quickly added nut-based drinks. Forager’s vegetable chips are created using the juice’s pomace, and their cashew milk led to Cashewgurt, a delicious nut-based yogurt by culturing the nut milk.